Material For Repairs In An Apartment Is Under Construction, Remodeling, Rebuilding And Renovation. 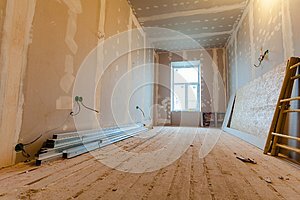 Photo title: Material for repairs in an apartment is under construction, remodeling, rebuilding and renovation. Material for repairs in an apartment is under construction, remodeling, rebuilding and renovation. Making walls from gypsum plasterboard or drywall.